The agency put the estimate in an exchange helper paperwork review filing in July. Analysts at the Centers for Medicare & Medicaid Services were assuming a year ago that the new public health insurance exchange system would take in just 4.3 million applications during the entire 2013-2014 open enrollment season. CMS officials included that estimate in a routine paperwork review filing for exchange helper certification programs. 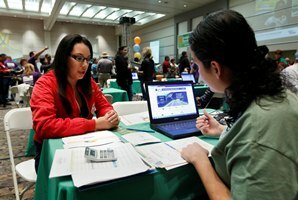 Around Oct. 1, when the first Patient Protection and Affordable Care Act open enrollment period began, officials at the U.S. Department of Health and Human Services, the parent of CMS, declined to say how many people they expected the exchanges to enroll in commercial “qualified health plans” or government plans. Many exchange watchers used a projection of 7 million, from the Congressional Budget Office, as a benchmark. But CMS itself used the 4.3 million application figure back in July, when it was estimating how many “navigators,” or official, PPACA-required ombudsmen, and “non-navigator assistance personnel,” it would need to help consumers. HHS reported in January that all state-based and HHS-run exchanges combined had received 4.3 million coverage applications for 5.1 million people from Oct. 1 — the start of the open enrollment season — through Dec. 28. HHS stopped releasing application totals, saying it believed that enrollment system problems made the application numbers unreliable. But HHS said in March that the exchanges had actually received plan selection information, not just applications, for 4.2 million people by March 1, and it said Tuesday that the public exchanges had received plan selection for more than 7.1 million people by March 31. From Oct. 1 through Dec. 28, exchanges were determining an average of 1.2 people eligible for coverage for each application received. If a similar ratio held true through March 31, the exchanges may have received about 5.9 million applications, or 37 percent more applications than CMS officials had expected. CMS says it could get as many as 30,000 CAC certification forms for the 2015 enrollment period. The agency was expecting to get just 2,100 certification forms for non-navigator assistance personnel for the 2013-2014 plan year. The agency is assuming that CACs will earn an average of about $27 in wages and benefits per hour, up from an estimate of $20 per hour given in the 2013-2014 enrollment period paperwork review form.